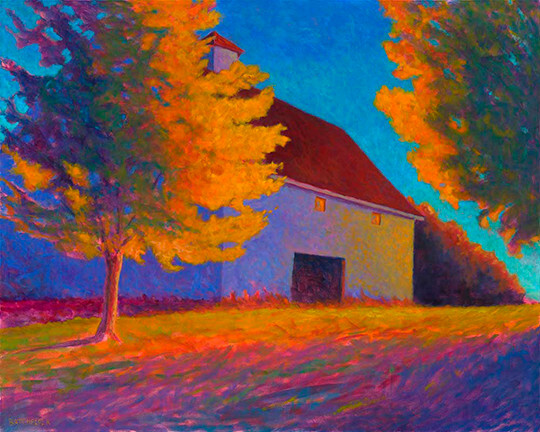 Peter Batchelder is a successful landscape artist who is represented by many galleries throughout New England. Using a vibrant color palette and painted with oil on canvas, much of Peter's artwork is inspired by barns and other structures in natural settings, and coastal scenery. Peter has been a Jetart Company client since 2013. We photograph Peter's original artwork and print giclee reproductions on paper and canvas. (Digital files of previous photographic captures have been used for this purpose as well.) A quote from Peter: "having used other fine art limited edition printers in the past, Rich and JetArt bring a level of quality, passion, and attention to detail that makes each print a work of art unto itself." Most of Peter's artwork is 30" X 40" or larger and many pieces are priced above $4000. These two factors, original artwork size and price,, support the ability for Peter to profitably offer giclee reproductions. Image above shows several prints on permanent display in a new medical building in Stamford, CT, owned by Greenwich Hospital. With some original artwork sizes exceeding 36" X 48", reproductions can be printed at a size sure to meet customer needs, for example when space is limited. Given the prices of original artwork, high quality reproductions can be offered at a substantial savings to the customer, while further monetizing the original artwork for Peter. Finally, reproductions remain available even after the original artwork is no longer available.